We consider a new hierarchization algorithm for sparse grids of high dimension and low level. The algorithm is inspired by the theory of memory efficient algorithms. It is based on a cache-friendly layout of a compact data storage, and the idea of rearranging the data for the different phases of the algorithm. The core steps of the algorithm can be phrased as multiplying the input vector with two sparse matrices. A generalized counting makes it possible to create (or apply) the matrices in constant time per row. The algorithm is implemented as a proof of concept and first experiments show that it performs well in comparison with the previous implementation SG++, in particular for the case of high dimensions and low level. 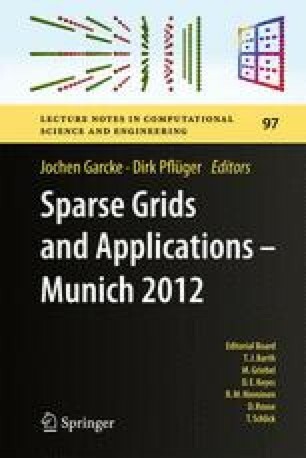 I am grateful to Dirk Pflüger for introducing me to the topic and providing me with the SG++ source code. For many fruitful discussions I want to thank Gerrit Buse, Dirk Pflüger and Hans Bungartz. Special thanks go to Philipp Hupp for many helpful comments and discussions to improve the presentation.